Wow! I though you were kidding about jumping out of a ballon. I just couldn't figure how you'd mounted the camera under the basket like that without the mounting boom showing. Glad you enjoyed my videos. I just shot some more footage using the strut mount pointed at the skis. I was out landing on a lake about 30 miles out in the middle of no where. I'll upload as soon as I edit and find some appropriate music. Edit: Just uploaded the video. Darn camera cut out after only 2 minutes of video! Only got the first touch and go. Quick question for you. What camera are you using and what video editing software do you use. I just got a contour camera that I'm going to mount inside the cockpit for leadplane missions, but don't think I can edit it down to few minute bursts for youtube. Thanks and great videos. Thanks. I'm using a Drift HD170. I chose it primarily because of the wireless remote to start and stop recording. That alone saves a lot of editing time. It also has a built in LCD screen for aiming, and a rotating sensor that makes leveling the shot easy. For editing I just use Windows Movie Maker. For the simple cut and splice work I do it's more than enough. Should of put this in here a while back. Warning: this is what happens when two members of Chikenwings meet up viewer discretion is advised, all those of a nervous disposition look away now! 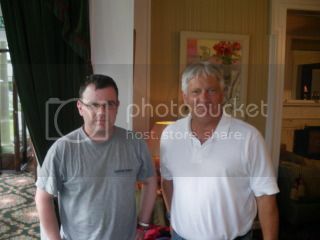 Me and R/C meeting up in a hotel in Prestwick. Whoops! You beat me to it, Ian! Hehe. It was a fun, but way too short visit. Maybe next time we can enjoy a pint. ...Or three or four or five! Hehe.